What is a Septic Tank? What is a Cesspool? The septic tank was patented in London around 1900. 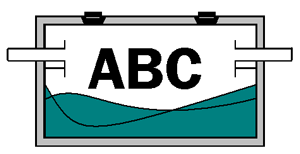 Websters Dictionary defines the septic tank as “A tank in which waste matter is decomposed through bacterial action.” The modern septic tank is a watertight box usually made of precast concrete, concrete blocks, or reinforced fiberglass. 1. Organic solid material floats to the surface and forms a layer of what is commonly called “scum.” Bacteria in the septic tank biologically convert this material to liquid. 3. 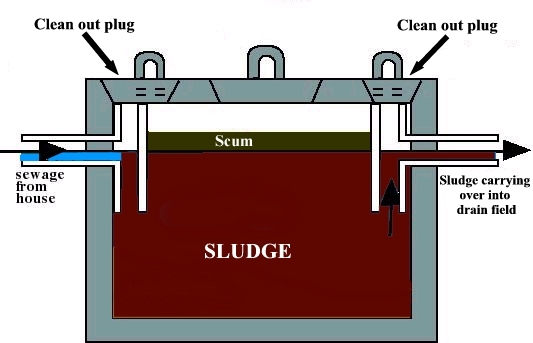 Only clear water should exist between the scum and sludge layers. It is this clear water – And only this clear water – that should overflow into the soil absorption area. Solid material overflowing into the soil absorption area should be avoided at all costs. It is this solids overflow that clogs soil pores and causes system to fail. two main factors cause solid material to build up enough to overflow: (1) bacterial deficency, and (2) lack of sludge removal. Bacteria MUST BE PRESENT in the septic tank to break down and digest the organic solids. Normal household waste probides enough bacteria to digest the solids UNLESS any harm is done to the bacteria. Bacteria are very sensitive to environmental changes. Check teh lables of products you normally use in home. Products carrying harsh warnings such as “HARMFUL OR FATAL IF SWALLOWED” will harm bacteria. People rarely think of the effect of these products on the septic tank system when the products go down the drain. What kind of effect to you think anti-septics have on your septic tank? Bacteria must be present to digest the scum. If not digested, the scum will accumulate untill it overflows, clogging the soil absorption area. 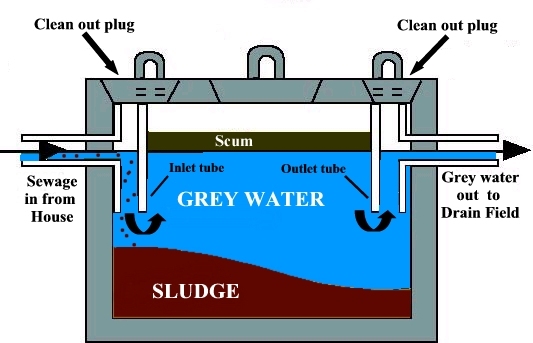 The sludge in the septic tank – inorganic and inert material – is not biodegradable and will not decompose. If not removed, the sludge will accumulate until it eventually overflows, again clogging the soil absorption area. Cesspools (or leaching pools) are pits into which concrete, brick or cement block walls have been placed. 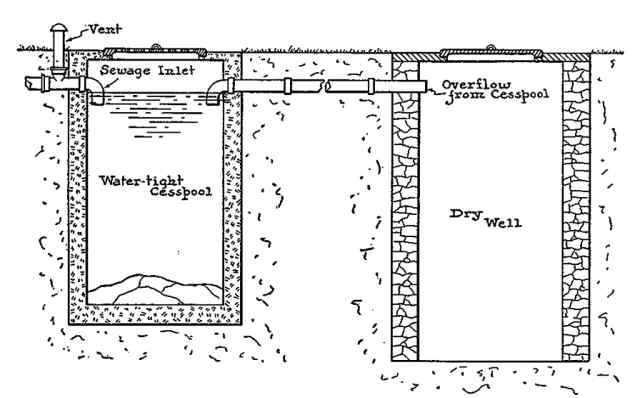 Wastewater flows into the cesspool and drains or “percolates” into the soil through perforated walls. 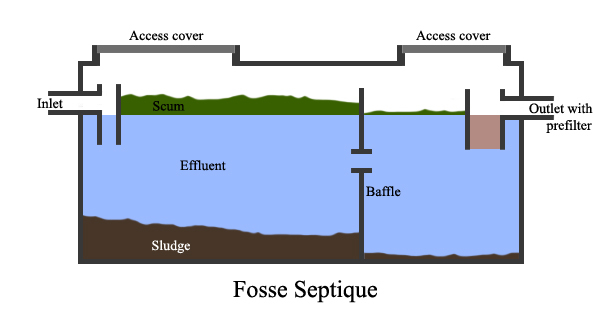 Cesspools which serve only as “overflow” pits from septic tanks are much more efficient than the older systems because they receive much less solid material. However, where there is no septic tank to hold the solids, the cesspool will require much more maintenance. Over time, when the drainage area around the leaching pool becomes saturated, additional pools may have to be dug to handle the volume.